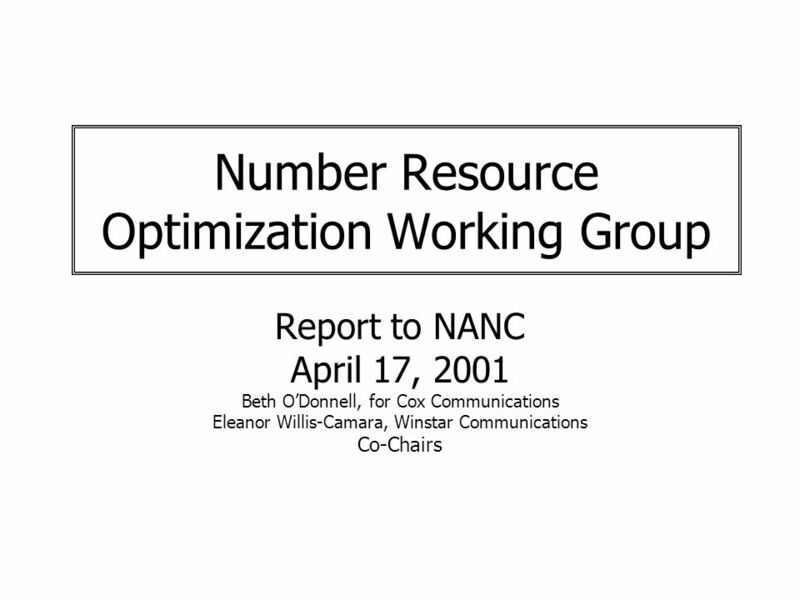 Number Resource Optimization Working Group Report to NANC April 17, 2001 Beth ODonnell, for Cox Communications Eleanor Willis-Camara, Winstar Communications. 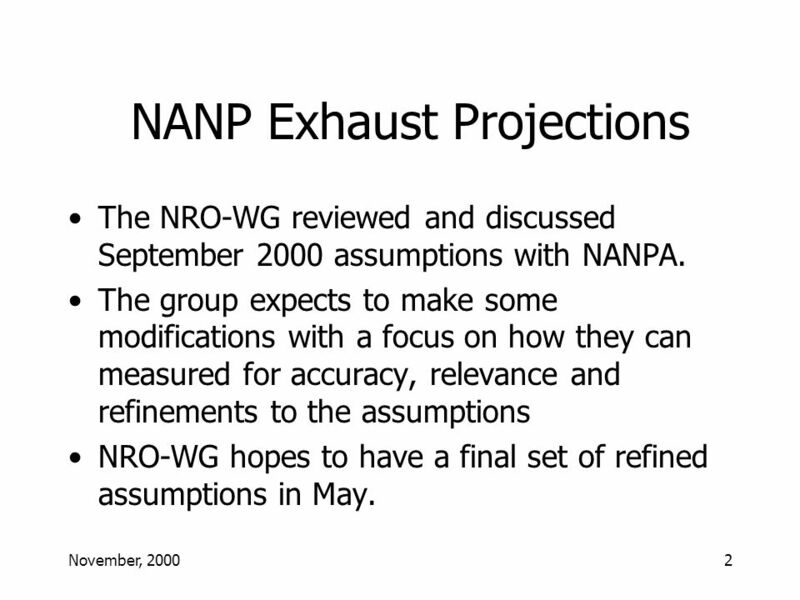 2 November, 20002 NANP Exhaust Projections The NRO-WG reviewed and discussed September 2000 assumptions with NANPA. The group expects to make some modifications with a focus on how they can measured for accuracy, relevance and refinements to the assumptions NRO-WG hopes to have a final set of refined assumptions in May. 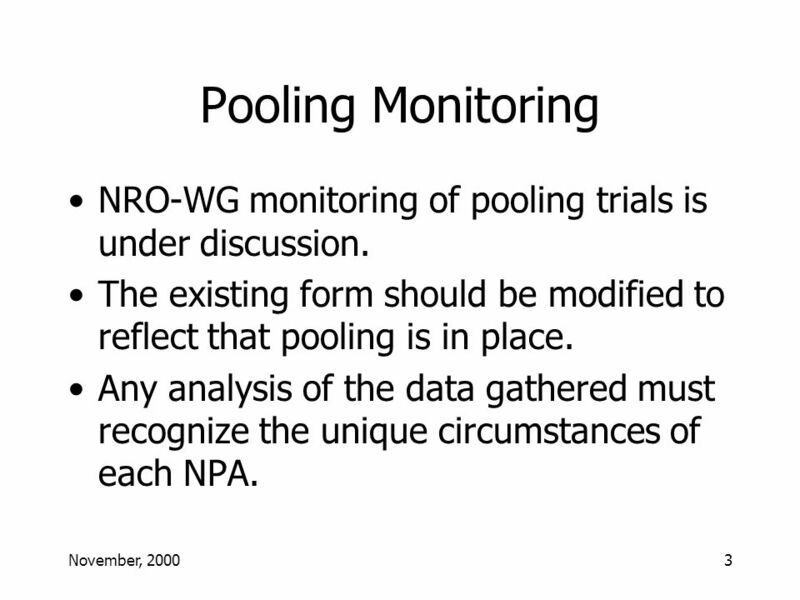 3 November, 20003 Pooling Monitoring NRO-WG monitoring of pooling trials is under discussion. The existing form should be modified to reflect that pooling is in place. Any analysis of the data gathered must recognize the unique circumstances of each NPA. 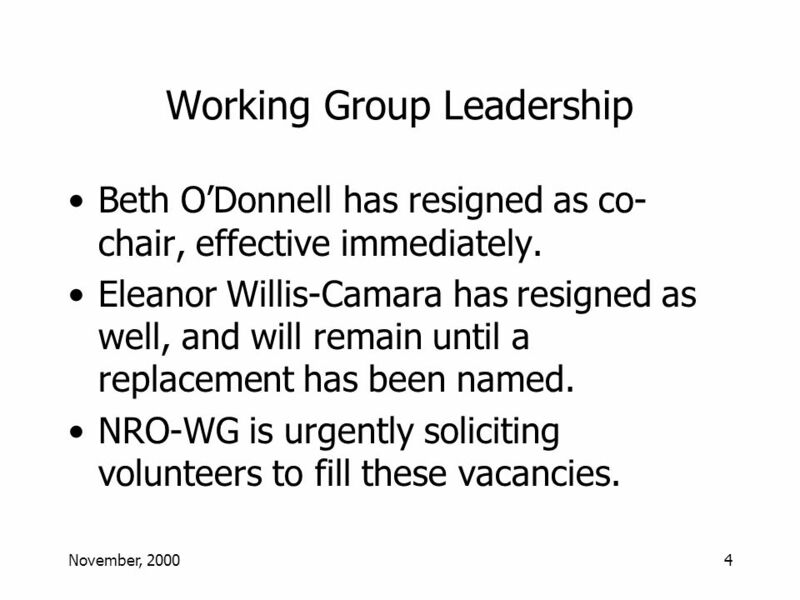 4 November, 20004 Working Group Leadership Beth ODonnell has resigned as co- chair, effective immediately. Eleanor Willis-Camara has resigned as well, and will remain until a replacement has been named. NRO-WG is urgently soliciting volunteers to fill these vacancies. Download ppt "Number Resource Optimization Working Group Report to NANC April 17, 2001 Beth ODonnell, for Cox Communications Eleanor Willis-Camara, Winstar Communications." 1 January 18, 2000 NANPA Report to the NANC Prepared by: NeuStar January 18, 2000. INC Report to the NANC November 2000 Norman Epstein INC Moderator. PANI IMG Report to NANC November 30, 2006 pANI IMG Co-Chairs Don Gray – Martin Hakimdin Natalie McNamer – Bill Shaughnessy. NANC Number Conservation Ad Hoc Charge (per 2/21 NANC) Should an IMG be commissioned? If yes, Scope of assignment Time & Budget. 1 INC REPORT TO THE NANC March 2002 INC Recommended Plan for Expanding the Capacity of the NANP David Bench - INC Moderator. NANC Report NANC Training (NT) November 30, 2005 Beth ODonnell, Cox Communications Rosemary Emmer, Sprint Nextel. NANPA Oversight WG Presentation to NANC February 22, 2000 Co-Chairs Pat Caldwell & Karen Mulberry. NANPA Oversight Working Group Report to the NANC January 16, 2000 Chair Pat Caldwell. NENO IMG NANC Report January 15, Agreements Reached IMG deferred end date pending review of NRO 3 Order Scaled back objectives and agreed to consolidate. Number Resource Optimization Working Group Report to NANC July 17, 2001 Eleanor Willis-Camara, Winstar Communications [Co-Chair position vacant] Co-Chair. N FCC Numbering Symposium State of the NANP Presented by the North American Numbering Plan Administrator (NANPA) and the National Pooling Administrator.